As a teacher, what has been your biggest challenge to overcome? Perhaps it's been juggling planning and prep with a busy schedule. Maybe it's been working with the child in the classroom who never has homework, always needs to use the bathroom or run an errand, and never stops talking. It might even be working with difficult parents. In my situation, the obstacle I lose more sleep over and stress about is reaching what Donalyn Miller in The Book Whisperer calls, "The Dormant Reader". Yes, I have worked with all reader types throughout my teaching career, but this one is personal. This one is my youngest. Reading did not start out this way for her. She was an avid reader through second grade, but gradually, she's lost momentum. She began abandoning books and/or making comments such as, "This book is boring," or "I hate reading." I think some of the conflict has been her way of being an individual and not just going along with what is really important to mom. We've also battled the appeal of games on the computers, ipods, and ipads, but we seem to be moving in the right direction now, and I want to share a few strategies I've used to make this happen. I helped my girl create a list of topics she was interested in and books that she liked. I also suggested that she look on Amazon for books by the topics she was interested in and put them on the list. (This can be done at school with our students too.) When we got to the library, I suggested that she ask the librarian to help her locate books that would match her interests. That took me out of the equation, and she came home with a huge stack (and finished two straight away). Another great book recommending site is Goodreads. You have to get a subscription, but it is free. This is a great thing because you can save your list, review books, see which titles are like those you like, and more. As a teacher, we could use this site with our students to check out and leave book reviews for books read. This is the next thing I plan to mention to my girl. At school, I set up a corner of my room for my class library. I brought in pillows, bean bags, a cozy rug, and made crate seats. 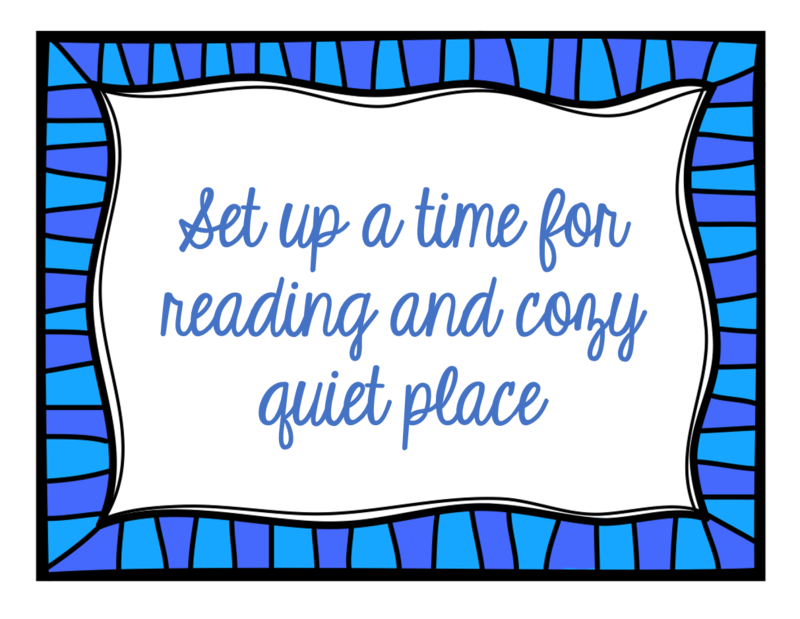 I also set up other reading nooks for paired reading. All my seating options are easy to move and allow kids to lay on the floor for reading. At home, we lofted my daughters bed to set up a comfortable area with a lounge chair, and this worked well. However, my daughter is not one to sit for long, so we will also be reading on the fringes more such as when we are waiting for dinner to come in the restaurant, for appointments, as we ride in the car, and before school. During school, if you have children who aren't reading at home, use the fringe time to get in the minutes at school. 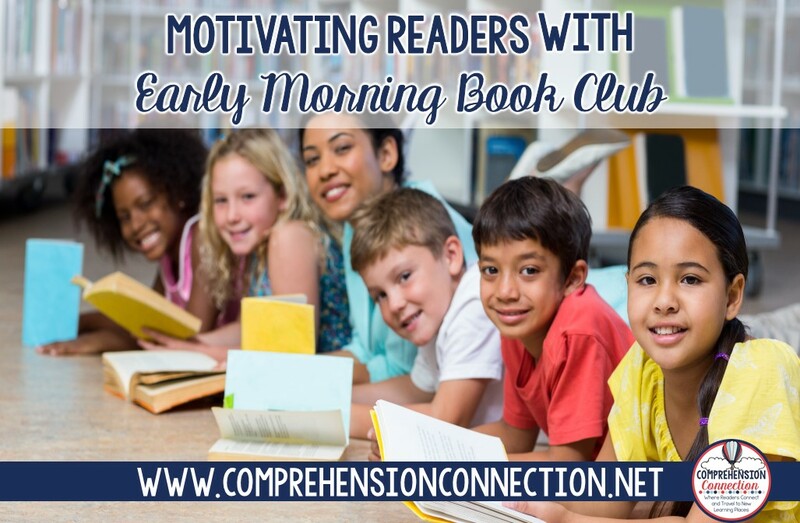 Today was the first day of Early Morning Book Club, and I thank Jeff Gunhus for this great idea. Jeff spoke at the Virginia State Reading Conference this weekend about how he used this strategy to inspire his son, Jackson, and I just love it. For their routine, he and Jackson meet several days a week an hour earlier than normal to have special time for just the two of them to read together. He set it up with a great cup of coffee and hot chocolate, a comfy place on the sofa in front of the fire, and a book that could not be put down. The big rule...the book could only be read together and only during book club. That gave the motivation for both to get up to find out what happens next. Here are the suggestions he shared with us, and I share them with you with his permission. ❶Find the time that works best for your family. ❷Read with a pencil or sticky notes (if it's a library book) to mark the words that aren't familiar or that are tough to pronounce. ❸Read out loud...alternating pages. If an audio version is available, this is an option too. The reason for this is for the child to hear fluent reading. ❹Make the reader feel safe. No judgement in book club allowed. ❺Choose the right book...high interest, fast paced, strong lead, short chapters, and cliff hangers. ❻Limit access to the book to only during book club. ❼Relate to the book after reading. Talk about it after, but avoid a list of questions. ❽Write your own stories after...another adventure the main character is involved in or just free writing about topics of your own choice. ❾Celebrate finishing the book with a special dinner, going to the movie, or something the reader chooses. ❿Finally, make it fun. Have snacks and make it a special time together. My daughter and I chose to read The Book Thief. She was up at 6:30 this morning ready to go, so I hope the enthusiasm continues. If you are a Title 1 school and wish to offer this to your families, Jeff has put together a very inexpensive book about it and other ways to engage "reluctant" readers at home (less than $1.00). More information can be found on his website. 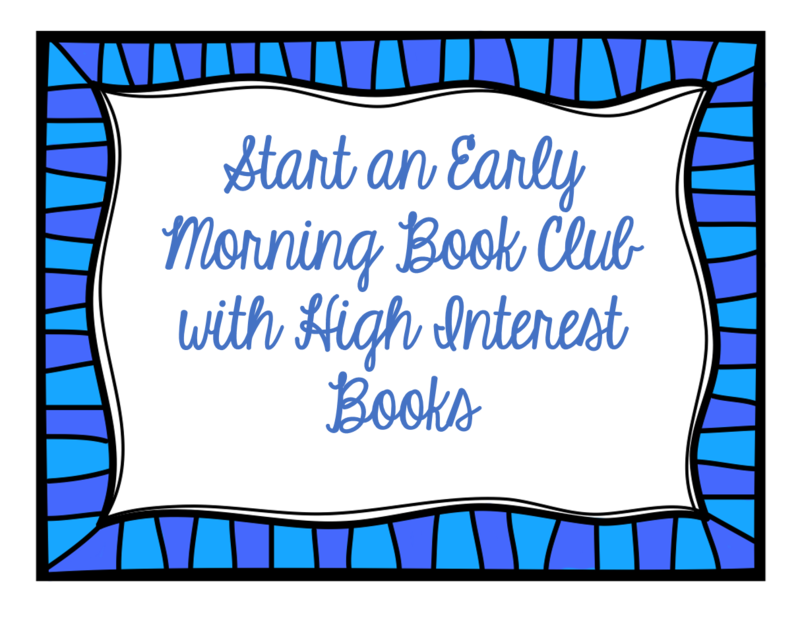 If you've been wanting to try book clubs in your classroom, you might check out the posts below. I'm also including a subscriber freebie related to this post. One thing I learned from The Book Whisperer is that real reading is the best motivator, so if we can just get kids into a series or a genre that they can relate too, we'll get them over the hurdle. Mine now is an avid reader, loves blogging about her books, and writes LOTS of reviews. Do you think their parents will do it? I am trying to figure out whether my parents would be willing. I think so many parents are non-readers (by choice), and with busy schedules, I don't know that they'd make the commitment. Great post!! I need to check out Goodreads. I should think about a morning book club. I do breakfast duty. Maybe I could do some kind of "breakfast club." Hmmm....I will need to think about it. It's actually a parent-child book club idea. 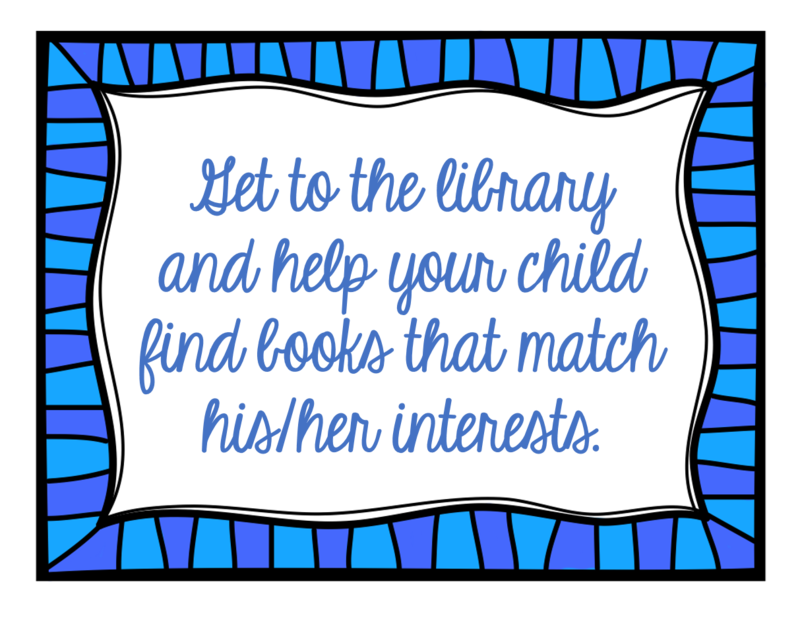 The parent and child select a book together and set up times for reading together. You could modify and use at school with students before school too. He talked about a second book club he did with just boys over lunch. I plan to share information on that later in the week. 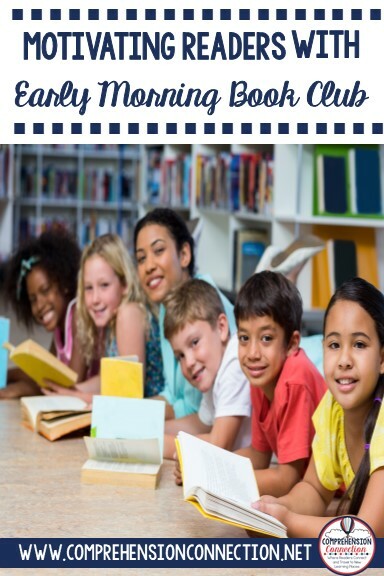 I love this idea of a parent-child book club. We did something similar to this but just before bed. Now my son wants to read everything on his own. I miss that time we used to spend together just reading. But I do like seeing that he is reading on his own and enjoy it! Thanks for dropping by Andrea. We're enjoying it so far, and it's so wonderful to see kids develop an excitement for reading.